Valentin Seiche is a French cartoonist and comic book creator. Born in 1987, young Seiche basked himself in Super Nintendo, Japanese culture and Japanese art. A combination that would heavily influence the direction of his art style. Seiche has worked with Ankama Editions, the publishing arm of French video games company Ankama. He along with Laurent Box, worked on the fantasy adventure book, Anguille & Baldaquin. Valentin Seiche also added his artistry to the sprawling Spera epic, contributing a chapter in the award-nominated Spera: Ascension of the Starless. 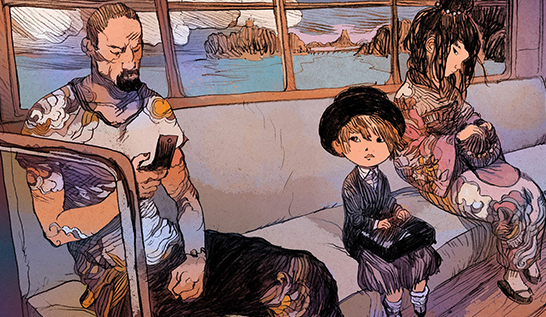 Last year he partnered with Swedish comic and art publishers, Peow Studio, for a mini-comic titled Wrecked Ship. The sequel of which is due to be released this year. To find out what else Valentin Seiche is working on, check out his tumblr, Approaching The Air Fortress. You can also see some of his older work on his Blogspot.